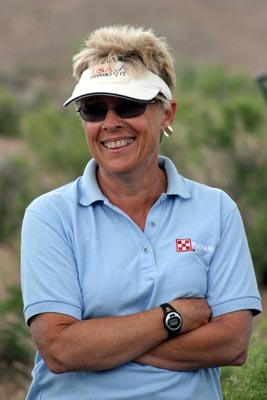 Becky Hart is an AERC Hall of Famer with 20,000 AERC miles under her belt, and a former multiple World Endurance Champion; but what she won't be doing at the Kentucky Cup and North American Endurance Team Challenge in Lexington, Kentucky, on October 14th, is riding. Becky is also the US Endurance Chef d'Equipe, but what she also won't be doing at the Kentucky Cup is coaching. "I'm going just to watch, though if someone asks for advice, I can give it." Since this competition is the pre-ride for the World Equestrian Games Endurance in September of 2010, Becky is hopeful all of the US riders will be focused on that bigger picture. Some riders are going to Kentucky this year to qualify their horses and get their COC (Certificate of Completion - a 100-mile ride time in under 12 hours and 20 minutes) for next year; some are already qualified; but "some of the horses are so good that even if they aren't going for a win in the Kentucky Cup, they'll be right up there." Becky expects Spain to do well in the 100-mile ride - which is to be expected, since Maria Alvarez Ponton will be heading the Spanish contingent. Maria was recently crowned the European Champion in Italy last month, in addition to her World Endurance Champion title from Malaysia in November of 2008 - on the same horse. She will be riding a different horse, Sahara, in the Kentucky Cup; and her husband Jaume Punti Dachs will also be riding. "Spain is the one we've patterened our crewing efforts after," Becky says, "though since only 2 people are allowed in the crewing box in Kentucky, we can't do our bucket brigade. "It'll be a good competition, a fast course." Becky really won't, however, be just kicking back and watching the Kentucky Cup, either. You can bet she'll be wholly occupied, appraising and absorbing every detail of the ride - the horses, riders, times, course - with a critical eye regarding the World Equestrian Games endurance competition next year - the ultimate goal of the US riders and coach.